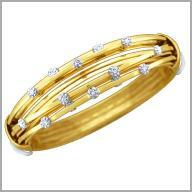 14k yellow gold bangle bracelet,0.504 ct diamonds. Achieve geometric glamour with this sparkling bangle Bracelet. This wide 14 k yellow gold bracelet, boasts a multirow design of crossover goldwork across the top. The rows feature 14 round full cut diamond with a weight of 0.504 Ct in H color and SI in clarity.